For the second New York visit in as many nights, the Habs travelled to MSG to take on the New York Rangers. Claude Julien dressed the same lineup as Monday night, except for Carey Price and his red pads returning to his crease in the place of Antti Niemi. For the Rangers, ‘King’ Lundqvist was expectedly between the pipes. The Rangers came in on a bit of a hot streak having won their last three contests. Things looked good early for the Habs, but they lacked discipline and ran out of gas which was even more important after they lacked the necessary killer instinct when given the chance. The result was a 5-3 win for the Rangers and the Habs will head to Thursday’s contest with the mission to tighten up defensively and learn how to play with a lead. The young Habs have some tough lessons ahead in terms of discipline and defensive play if they want to compete as the calendar gets tougher down the stretch. A faceoff deep in the Canadiens zone only 13 seconds in was turned into the game’s first goal as the Rangers defender whiffed on a Jordie Benn clearing attempt which sent Tomas Tatar on a 2-on-1 with Phillip Danault. Tatar opted for the shot which fooled Lundqvist for a lead with only 23 seconds expired. The goal got the Habs going immediately as the play was clearly in the Rangers zone other than when the Matthew Peca line was on the ice. This was the case for the opening five minutes, at which point the Rangers caught both Noah Juulsen and Xavier Ouellet on bad pinches for back-to-back 2-on-1’s that Price stopped to bail out his defenders. This sequence woke up the Rangers who took over for the better part of the next five minutes as Price was solid to preserve the lead. Price’s best stop came after the ten-minute mark as he came across to stop a Jimmy Vesey cross-ice one-timer and then he stopped the rebound before getting a faceoff. With 7:39 to play, Noah Juulsen fumbled the puck but was able to recover in time to get out of the zone. This proved to be important as Mats Zuccarello took a penalty for slashing on the play, a call I’m sure the official would like to have back. The first Habs power play unit was unable to gain the zone but some strong puck plays by Andrew Shaw gave the second unit some good chances and forced Lundqvist to make some good saves. With 4:20 to play, the puck took a funky bounce on Jonathan Drouin as he was exiting the Habs zone. The result was a turnover that allowed Kevin Hayes and Chris Kreider to come in 2-on-1. Hayes waited until Benn slid on the ice before finding Kreider who had a wide-open net to tie the game. 30 seconds later, the Habs would return to the power play when Jesperi Kotkaniemi was high-sticked by Lias Andersson. The man advantage did not look any more dangerous than the first time around and so both teams returned to the locker room tied at one goal apiece. The second period started at 4-on-4 for a minute as coincidental minors to Max Domi and Marc Staal were up on the board. Unfortunately for the Habs, a penalty to Danault 30 seconds in gave the Rangers a 32-second 4-on-3 advantage. The Rangers were not able to threaten Price with those 32 seconds or the rest of the man advantage. The next two and a half minutes were spent mostly in the defensive zone for the Canadiens as they were constantly second on loose pucks. This was finally stopped by a strong shift for the Danault line that saw the Rangers really scramble. Eventually, a quick pass by Danault to the front of the net allowed Tatar to redirect the puck past Lundqvist for a 2-1 lead. Lias Andersson was sent to the box for high-sticking a few minutes later and this time, the Habs would make the opposition pay. A corner battle for the puck lured the Rangers defender who left Domi all alone in front of the net. When Gallagher won said battle, he sent the puck to Domi who put a quick move on Lundqvist before scoring for a 3-1 lead. Some rough stuff ensued and really changed the momentum of the game when Cody McLeod lined up Joel Armia with a late hit. Domi took exception and charged Filip Chytil. McLeod retaliated with a stupid punch to the face of Drouin who was already being hit. Mike Reilly also retaliated by charging McLeod when the puck was nowhere near them. This last hit sent McLeod over the edge as he tried to fight Reilly. The outcome of the shenanigans: two minutes to Reilly for interference, while McLeod received two minutes for interference, an additional four minutes for roughing, and a game misconduct. The four-minute man-advantage got even better for Montreal as Brendan Smith took a penalty for tripping with 44 seconds to go in the man advantage that would send Armia to the locker room for the rest of the night. The 5-on-3 would not last long since Tatar was given an interference call shortly after it began. The rough stuff continued as Domi was called for holding, though I have no idea why Staal was not called coincidentally. 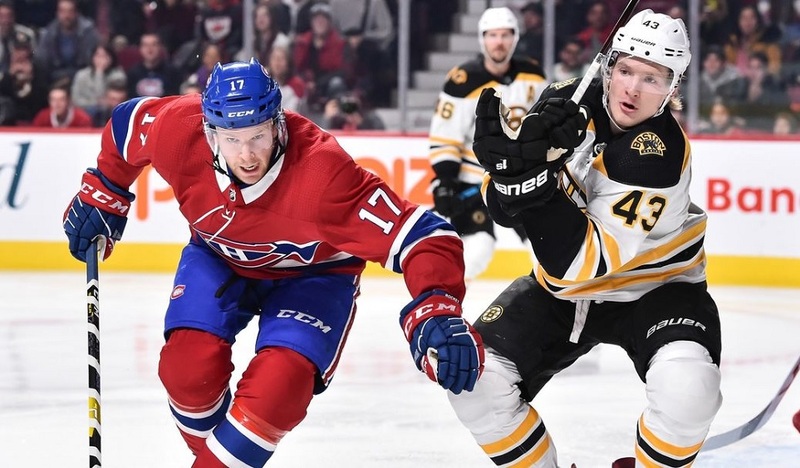 In the end, the result was that the Habs relaxed a little too much as they created nothing to squander a golden opportunity to really put the game close to its end. Instead, the Rangers came out recharged and with four minutes to play, they were given another man advantage when Danault was called for hooking. This time, the Rangers would score on the power play when Anthony DeAngelo shot from the blueline as the penalty expired and the puck floated through a crowd, beating Price to make it a one-goal game heading to the third period. The Rangers were faster the Habs to start the third period, but it was Juulsen who got the physical play going when he landed a big hit on Brady Skjei albeit a little late. Four minutes into the period, the Habs were handed the first penalty of the period as Charles Hudon was called for a weak hooking minor. 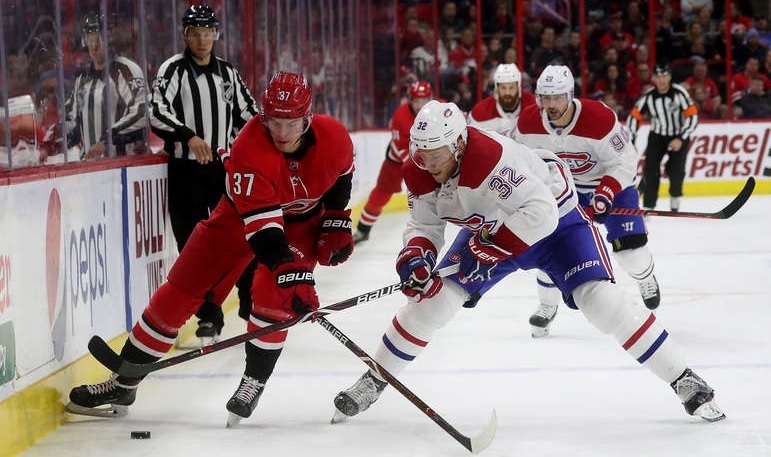 The Habs played a strong penalty kill and escaped, but one could sense that the many useless clearing attempts up the middle was eventually going to cost them. Ultimately, it wasn’t a pass up the middle that cost them, but the Domi line got caught with three men deep which opened up the passing lanes. A Staal shot off the rush should have been controlled by Price, but it wasn’t and Pavel Buchnevich put home the rebound to tie the game. 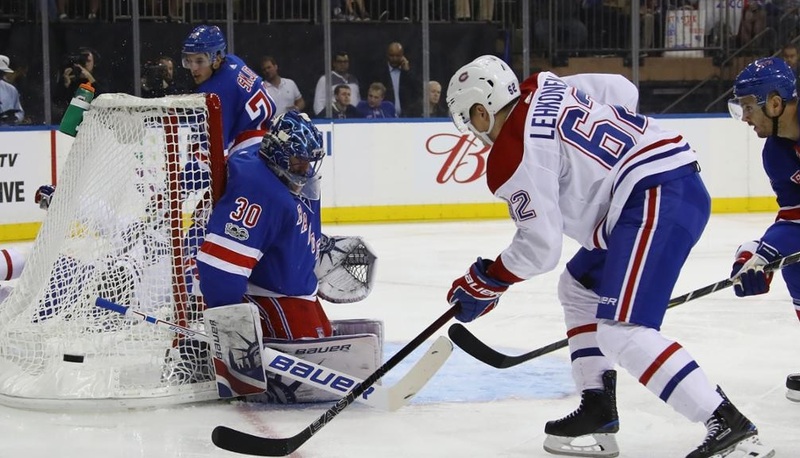 The goal gave the Rangers wings as they completely dominated the Canadiens for a long stretch. The Habs had difficulty having the puck long enough to even get out of their zone. This end of the third period looked like what many fans thought the Habs were going to look like before this season started. It was that bad. Finally, with 3:50 seconds left, the Habs were given another penalty, this time for too many men on the ice. The Rangers’ Jimmy Vesey took a hooking penalty 50 seconds later as Petry fell rather easily. At 4-on-4, Neal Pionk completed a spin-o-rama to deke Drouin before completing a Bobby Orr end-to-end play as he made both Price and Juulsen look rather silly on the play. As play resumed, Zibanejad was all over his own rebound as it bounced off Reilly and both Juulsen and Drouin skated by the puck to give the Rangers a 5-3 lead which they held onto the rest of the way. The only player to offer a complete 60-minute effort on the night, Tatar was rewarded with some points on the board and didn’t get caught up in the garbage the Rangers lured the Habs in with. Stats: 2 goals, +2, 6 shots, 18:03 T.O.I. Shaw played a strong game in puck retrieval for his line as well as the second power play unit. His game was strong enough that he got the nod to play with Kotkaniemi and Lehkonen once Armia left the game. Surprisingly, he was also not involved in all the stupid play that ensued in the second half of this game. Stats: 0 points, -1, 2 shots, 1 hit, 15:36 T.O.I. On a night where Juulsen and Reilly looked completely out of gas and couldn’t make a pass that wasn’t a foot off the ice, Ouellet’s calm play placed him as the positive player on the blueline tonight. Nothing was flashy on his part, but he also wasn’t getting caught out of position or making soft plays on the puck all over the ice. Granted Mete, Juulsen, and Reilly are all still young; one would think that when the game is going as bad as it was for all three, Ouellet could have been given a bit more ice time when the Habs still had the lead? Stats: 0 points, +1, 1 shot, 2 hits, 16:38 T.O.I. Petry got 2 assists but still ended the night -3. On a night where the team had a lead and blew it, I’m forced to side with the weak +/- stat over the points since it’s really the defensive lapses that cost them on this night. Petry gets a mention and not a star. Stats: 2 assists, -3, 3 shots, 1 hit, 16:05 T.O.I.